Extremely cold weather is stressing the grid all over the United States. Tennessee Valley Authority has asked people to conserve: in their service area, every time the winter temperature drops one degree, they need to put another 400 MW online. Today, New England governors announced a plan to expand the gas delivery network, so more gas can be used for power. 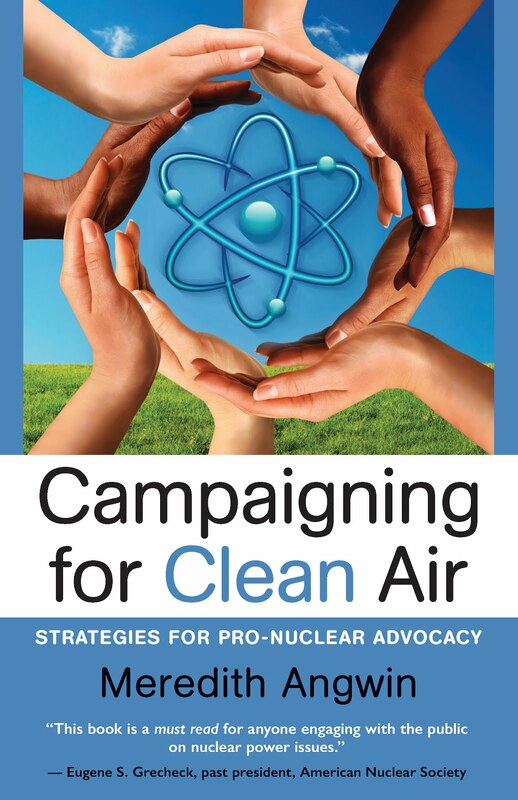 At the Merrimack Station coal-fired plant in New Hampshire, jet-fueled turbines are running. Yes, a small part of the New England grid is currently running on jet fuel! 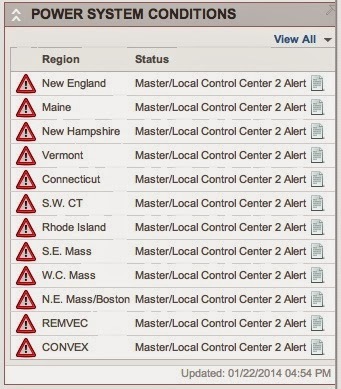 Like the rest of the grid, the New England grid is stressed and the power is expensive. 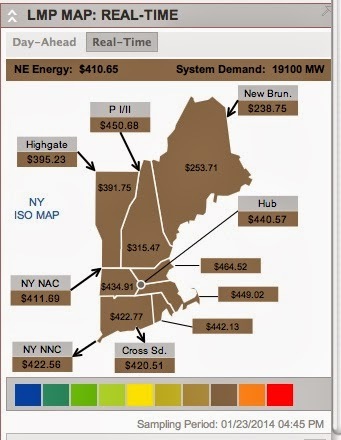 In the past few days, I have taken screenshots of various graphics on the ISO-NE (New England grid operator) website. These graphics are kind of like art. 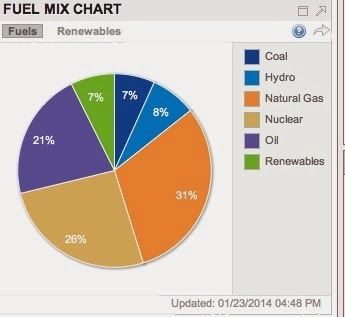 The graphics are not the whole story of the grid in cold weather, but they are a start. The graphics come from these two web sites: http://www.iso-ne.com/ and http://isoexpress.iso-ne.com/guest-hub Each graphic includes the day and time it was taken. Here's the grid at about 4:45 on Thursday afternoon. 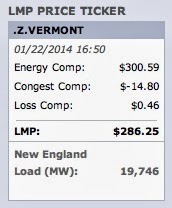 $360 per MWh is the same as 36 cents per kWh. The average price on the grid last year was around $36 per MWh or less than 4 cents per kWh. The price of power right now is ten times the average price for last year. These are a few more pix. The dates and times are on the graphics. 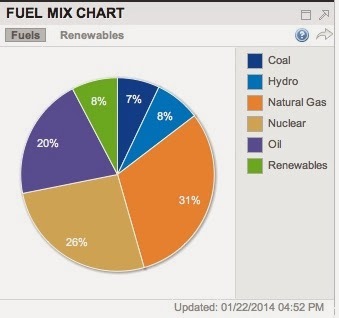 Cold weather stresses the grid infrastructure as well as stressing fuel availability. There's an excellent article today on grid infrastructure: Why Does the Power Go Out When It's Cold? by Eric Gunther at the National Geographic blog. Yes, you are right. Good question. 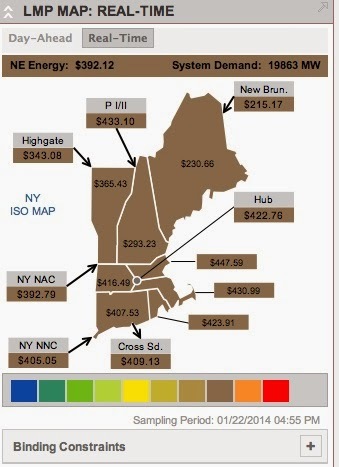 Basically, this is the "spot" price which the utilities must pay for electricity purchased on the spot market. Most utilities also have Power Purchase Agreements (PPAs) for a great deal of electricity at a lower price. But utilities would not purchase enough electricity with PPAs to fill all these peaks. So, this is the price above a previously contracted price...but basically, the utility would have a contract for a contracted price with a single provider, and expect to buy more power, as needed, from the grid. This is how the "grid" price is running. But wait, there's more! It's even more complicated! Green Mountain Power made a PPA with HydroQuebec, but the price of that power moves with the market price! So some PPAs are also affected by this price. Here's an old post, but it is still relevant about power contracts. I think the prices quoted are basically marginal prices - the price for the next unit of generation to be called on, or the cost of the last unit, which represents a floor for the next quote. Happy New Year! Happy Hogmanay!